4.”you may only get your blog AFTER you get back from sarah’s and you have good behavior there. OMGOSH PEOPLE!!!!!! DO YOU KNOW WHAT THIS MEAAAAAAAAANS???????????????? AHHHHHHHH IM GETTING MY VERY OWN BLOG!!!!!!!!! (and oh, if anything i post on my blog is SUPER important, ill transport it here!) I CAN’T WAIT!!!! AND OF COURSE ILL BE ON MY SUPER BESTEST BEHAVIOR AT SARAH’S!!!!!!!!!!!!!! YAHAYAHAYAHAAHAYAYHA HOOOOOOOOOOOOOOOOOOOOOOOOOOOOOOOOOOOOO! NOTE: This does not mean Samantha is not dissapearing from AGDC forever. Only her mini-blogs are. But what is worth worrying-she’ll have her own special website. And she’ll still post here occassionally (besides, she hasn’t even gotten her blog yet.) But look out world, here comes SAMANTHA ELIZABETH PARKINGTON!!!!!!! PLUS, it’s been snowing and sleeting all day today and is going to really snow AGAIN tonight! I’ve…been……dreeeeaaaaming of aaaaaa whiiiiiiite WEEKEND! here is a SNEAK PEEK of the snow! so i said, how about a birthday party? she said, but no ones birthday is coming up. and so i said, well make it up. well pretend it is one of our birthdays. so josie was like, ok lets tell the others! hello my name is kit and my sister samantha is the greatest. ok sorry for the interruption. you know little sisters. anyway, josefina, felicity, eva grace and i are going to make this birthday party post to surprise madeline. its sort of a competition because molly,addy,lulu,elsie and kathleen are doing one together. kit is going over to maria kits house that day so she wont be here. anyway, you know that new samantha doll across the street whos julias sister? yeh she is like my bff now. her name is hannah. shes so pretty and sweet and nice and guess what? you know how for the photo story competition we have only 4 and the other team has 5? she said she’d help us. i love her. like a friend, of course. hannah likes the idea of a birthday party, although in my heart i know she may not work for us. you see the girls on our side are more careless about cursive writing and straight A’s and stuff but the girls on the other side are all highest academics. their photo story will look like madeline did it. but ours will have a….uh…..um…”special”…doll personality to it. youll know who left their marks. anyway, hannah is a high academic cursive-writing girl. she may be more interested in what the brains have then what us besties have. wait… i got it! i got team names for us! the qualities of the brains is that they are super good at working together and that they are super smart and have high academics and can write in cursive. eva can write in cursive and is smart, but i want her to be on our team. anyway the brains can solve math riddles, know their way around the world with super geographical skills, and can recite the whole entire periodic table. they prefer mustard. the besties’s number one super power is girl power and friendship. they may not be as smart as the brains but they can recite the pledge of humor perfectly. they can ride unicycles and all are some part of the National Mega Annual Unicycle Awesome Extreme Power Races Of USA and Canada. and they are super super awesome. and they can shoot candy with their specially equipped Sweets And Treats Gun. they prefer ketchup. so there you go. which team are you rooting for? gotta go propose this idea to molly the team captain of the enemy. so bye! hey guys its your very best friend and greatest of the AGDC dolls, samantha. and have i got some juicy doll gossip for you. guess what? we are getting new traveling dolls. i heard that their names are “kayla” and “mary-sold”. mary-sold is a weird name, but i dunno. thats what i heard madeline say. anyway, they are coming on tuesday of this week (madeline has sewing class and lots of homework on that day, so she won’t get the photo story up until wednesday or something) and staying for a whole week. 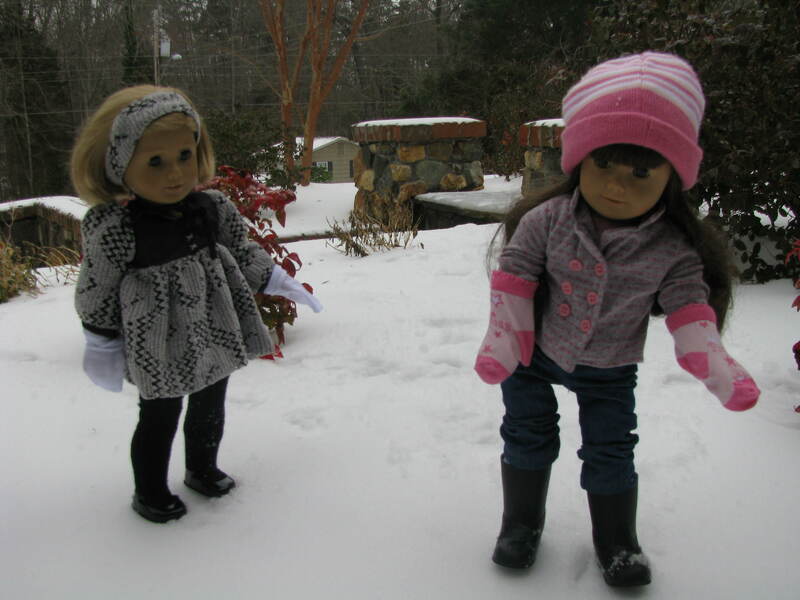 they are the dolls of madeline’s friend looren. (i am not surer if i spelled that right) but anyway yeah. oh and guess what? there is a new doll in town. that’s right. Julia, eva grace’s BFF, has a new sister. they got her for christmas. 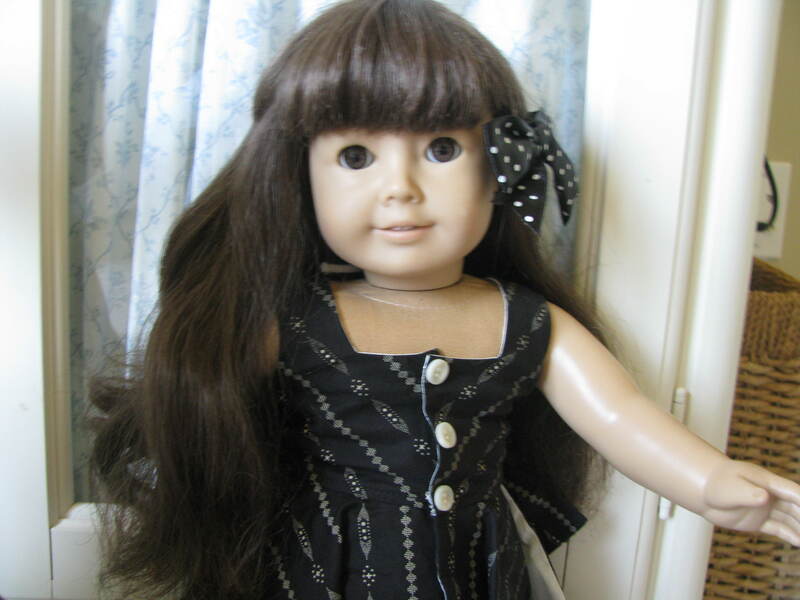 she is a samantha doll just like me. plus she’s MATTEL. i’m pre mattel. that’s a problem. maybe she won’t like me cause i’m PRE mattel. with her all ‘OOH IM MATTEL AND YOUR NOT’ attitude. 😦 hopefully not. hopefully she will set aside such a difference. there is also a new blog. it belongs to a blog-a-friend of madeline’s. her blog name is AGlover, i believe. i think her blog is called American Girl Doll Family. it’s so awesome. people you guys have got to check it out. why? because i SAID so! and you will not regret it, it is a nice blog. you’ll love it. madeline linked it on the right where all the linked sites are. well that’s all for today!!!! i love you guys. like a friend, i mean. you guys are totally awesomest. bye bye! BFF SEE YOU LATE-R!